If you are looking for a great cabin, convenient to town and activities, Bearfoot Bungalow may just be the ticket! 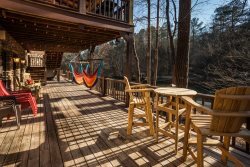 This charming cabin sits on a small ridge and the waters of the Coosawattee River can be heard from the spacious porches. The property is large enough that you can walk the grounds of the wooded surroundings and enjoy nature right in your own back yard. Inside the cozy atmosphere with tasteful furnishings will becon you to come, sit, relax and enjoy. With all the conveniences you would hope for in a mountain home. There is a lovely stone wood burning fireplace in the great room for those chilly mountain evenings as well as a separate living space on the terrace level that offers privacy if you are visiting with another couple or teenage kids. The king master is located on the main level with two other bedrooms, an additional kitchen and game area located on the terrace level. So why not head on up to Bearfoot Bungalow and start making some memories. Oh, don't forget, Bearfoot Bungalow is a dog friendly cabin so bring the entire family and enjoy what the mountains have to offer!